There is something friendly and comfortable about picking up a diary done by a particular artist, illustrator or based on a well-loved character. 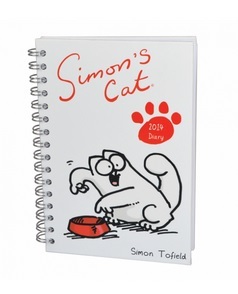 My personal favourites include: YouTube favourite Simon’s Cat (pictured) and Edward Monkton Illustrated Diary. Another beautiful choice is Gorjuss 2014 Diary Range (from Santoro).